I am so excited to share this Facebook Live and THESE POWERFUL PEARLS of functional medicine with you. At SAFM we teach our students to be both confident and highly skilled at “puzzle piecing” and finding the interconnectedness between pieces of each patient’s unique case. In this presentation, I’ll share a few staples but also some unexpected connections which might surprise you! Could community — not medicine — be the key to your patients’ and clients’ wellness? Learn practical ways to leverage this powerful (and necessary!) approach to wellness in your practice. Can the status of our social life really cause inflammation? Has the immune system evolved to listen to our social environment? Isolation as a true root cause of disease? This entire post resonates with me on every level. It was in fact my ah ha moment at the retreat. Thank you as always for your support and love. Thank you, Tracy, for all your inspiring facebook lives. You have also great energy! The power of community is often an ignored point to consider when we talk about our health. This was a very inspiring presentation. I am looking to have more of a sense of community for myself and my daughter, we often feel isolated except for work. 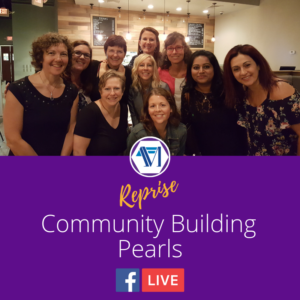 I loved how Traci encouraged that we just show up and be yourself, not someone else, and that by doing that you can inspire others who are also needing community. I love the idea of a tour of Whole Foods also. Thank you and I’m loving the SAFM courses. a chance to take a course! Love to take a class! The first time something clicked on how important community is was 2 years ago when I was reading ‘Outliers’ and one chapter talked about the Italians from Roseto who migrated to Pennsylvania and created their own community there. It talked about how they never got heart disease and they mostly died of old age, and how strange this was to American doctors because heart attack and high cholesterol was the number one killer for men at that time. It was shocking to me that when they investigated their diet and lifestyle they found out that they ate pasta, pizza, meat they also smoked and drank a lot but the one thing that kept them healthy was the strong loving community. That to me was a big eye opener on how important it is to feel loved and to have fun! And to feel that you belong. Thank you for this live webinar. I totally loved this topic. What I really liked was the topic on Blue zone region. I wrote a blog in blue zone diet and what I found common in all 5 zones is people are socailly connected cominity bonding , service is very high. I am a part of holistic group in india and we call it Sangha ( group ). This group is with people from across geographical, demographic, age, caste, Creed barrier and we just connect and we are very vulnerable in this group to open up and talk, express ourself, most of the time only to be heard , not seeking be adviced,judged . And people openly talk about things that they can’t talking their loved ones, as a result when they open up, the stress goes down and they feel better both physcually and mentally. Infact what I wrote yesterday in my page ( wish I could share here) that stress is desth bed and no amount of super food can help you. ,And one of the best way to help each other is by being a part of community of like minded people. I think when I looked at my circle of life few months back , social life scored low, after working on it most of the dis-ease have gone away. LOVED the community discussion. I am working as a health oach in a very small community and the transition has been very lonely and isolated. The reason I pursued a career in health coaching was because of my own issues with stress in my personal life and job. Shingles eventually led to adrenal exhaustion and I needed to take my health care into my own hands. To this day I am struggling with community and understanding of those in my local area, but the SAFM community has been amazing. Thank you for your pearls of wisdom and for the family atmosphere! Ian looking forward to so much more! I loved your energy on this Live and the fact that we DO have the power to make a difference. “Keep showing up! !” Is the line that striked me the most as we tend to expect things to happen overnight, almost magically and the truth is that we need consistency and patience to create the movement we want to see I this world. Loved the idea of tours in the stores, that is my next project and goal!! Thanks for inspiring me and reassuring me that I’m on the right path. Loved this! Community is so important. I’ve learned that not just for my clients, but for us as well. I felt isolated for a long time and after meeting other nutritionists and health coaches, I’ve actually felt my self confidence soar. We need the community to help each other out and feel connected. And for our clients…whew. I notice that most who have a strong sense of community are the ones who heal faster. This was a very nice addition to your other more in-depth bio chemical lectures and pearls you’ve given. Likely, the most crucial theme when it comes to root causes illness and dIs-ease and missed most of all in traditional medicine but likely still in many functional circles as well. This mirrors is as practitioners feeling isolated in thought as patients navigate their own transformation in health in a world clearing looking in from the outside doesn’t support optimal living in the least. You gotta fight for it. I hope to take another semenster soon; still digesting the last. It was very informative! Wow! I was struck by the comments on the need for community for myself as a practitioner. I encourage my clients but find myself so busy trying to build a business that I don’t engage in community and get that support for myself. I’ve found myself at times feeling like I want to walk away but you’re right, there are so many people out there that need what I bring to this field. Thanks for the reminder and encouragement. Always inspired by your videos. On the heel of the retreat, the message of community couldn’t have resonated more. Thank you for your continued passion- it’s infectious!